This shredder can automatically shred up to 550 sheets of paper with the touch of a button or manually shred up to 14 sheets into 397 (5/32"" x 1 1/2""; Security Level P-4) cross-cut particles. This machine also safely shreds CDs/DVDs, credit cards, staples, paper clips and junk mail. It is equipped with AccuFeed™ Technology providing fast automatic shredding for increased productivity. Simply load the drawer, push the button and walk away. For jam prevention, this machine uses auto reverse technology which automatically stops and reverses the paper if a jam occurs. Also, the SilentShred™ Technology and energy saving sleep mode system allow this machine to integrate easily to any environment. 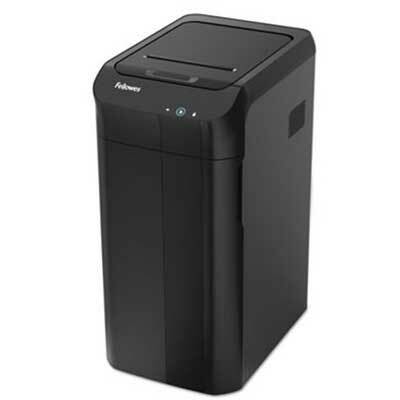 With the ability to shred continuously, it is ideal for shared use and includes a 22-gallon removable basket.